With the story of the meek salaryman or hirashain, Inuyashiki, and the teenager who're simultaneously struck by a a flashing white light like a cosmic ray and wake up turned into cyborgs, we are plunged into the world of manga at its least realistic, but still with plenty of human touches. (The original is by Hiroya Oku.) We also enter a franchise starting for director Shinsuke Sato, who has already done several cult manga films. * The 2018 NYAFF includes a couple of other manga adaptations, the high school nightmare River's Edge (which makes one long for Eighties American youth pictures) and The Scythian Lamb, a highly entertaining genre mix, with its absurd but promising premise of a brace of convicted murderers dropped into a small town as part of a nutty "repopulation" scheme. 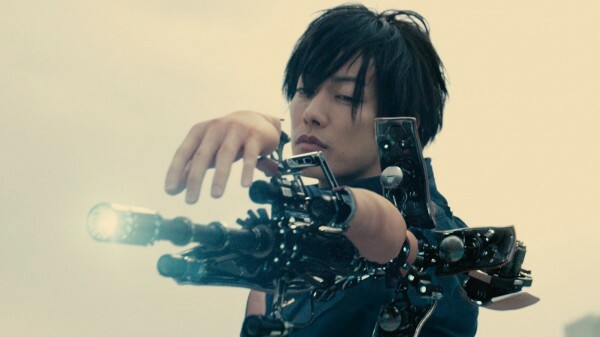 Shishigami seems more adept at using his cyborg powers than Inuyashiki, right away, as he shows them off to his pal Ando/aks/Chokko (Kanata Hongou), by crashing parked cars into each other in a parking garage. The powers are like a new technology kids have more of a feel for. When Inuyashiki catches on that his young counterpart is "shooting" people right and left by pointing his finger and yelling "bam!" he has to learn how to do the same thing in order to stop him - but it's hard. This recalls Josh Trank's 2012 Chronicle, where Dane DeHaan shone, about American high schoolers abruptly gifted with special powers who struggle to learn how to use them and make a mess of it. Like Hiro they have teen angst and superpowers are a bad thing to have with poor impulse control. The cyborg idea itself relates most notably to the seminal Nineties body-horror series Tetsuo directed by Shinya Tsukamoto, but this time without the creepy, haunting cyberpunk heavy metal style, only occasional dramatic flashes of CGI where man and boy sprout metal innards that flash, then fold back inside. When it comes to the browbeaten salaryman who becomes an unexpected hero, there is no greater or more memorable example of the theme than Kanji Watanabe (Takashi Shimura) in Akira Kurosawa's 1952 masterpiece Ikiru, whose profound humanism contrasts sharply with the falling off from moral values and good sense represented by manga and modern films. 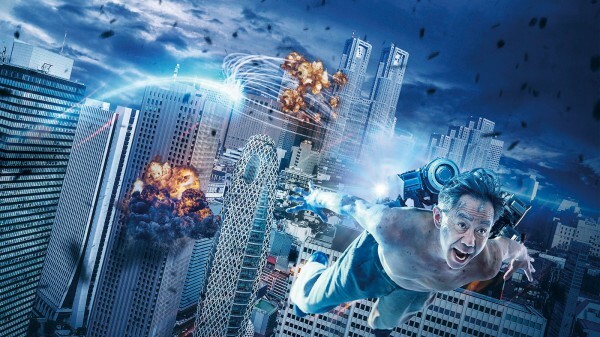 We must give Inuyashiki credit for highlighting feelings and behavior over violence and pure action, compared to many similar manga films; but in Ikiru, we're in the world of real life andInuyashiki, depicts a thin, comic book world full of cliché. Stopped by police for the family he killed after visiting his father, Hiro hides with a female admirer, Shion (Sumire Morohoshi). Then he begins killing people remotely through their PC or cell phone screens. He is mocked by trolls, so he kills 26 this way. He becomes the ultimate psychopathic young mass murderer now, deciding everyone is against him and that he must kill all of Japan, starting from the giant screen in Shinjuku. Now Inuyashiki becomes a disaster movie, with textbook fleeing, terrified crowd sequences out of Battleship Potemkin. Meanwhile the old salaryman tries to prepare to stop him, coached by Hiro's former best friend, Chokko. From then on for the last twenty minutes or so of this rather long movie it's a battle of the titans in the air and on the ruined tops of tall buildings in what, for Japanese cinema, is a pretty Hollywood-style display of grand special effects. Inuyashiki finally wins the respect of his hitherto utterly mean family (especially the female members) - even if the evil Hiro has a more prettily-sculpted torso. Inuyashiki / Inuyashiki / いぬやしき, 127 mins., debuted 20 Apr. 2018 in Brussels, at the International Fantastic Film Festival, also showing at Udine and at Montreal's Fantasia. It opened theatrically in Japan 20 Apr. 2018. It was screened for this review as part of the NYAFF, where it shows at the Walter Reade Theater in Lincoln Center Sun, 15 Jul. at 1 p.m.